Since a healthy guinea pig can live up to 7 years, her safety must remain a top priority to you throughout her entire life. You must be prepared to keep a watchful eye on the state of the cavy's housing, diet and overall health, every single day. Providing your guinea pig with a safe environment will ensure her a healthy and happy life. Many commercial cages hardly offer any room for the guinea pig to move around, let alone house separate areas for food, nest, toys and litter. The bare minimum cage size required for a single cavy is 7.5 square feet of flat floor space; the minimum is 10.5 square feet for three or more cavies. Providing a cage that's larger allows for your guinea pigs to exercise and to have their own spaces, preventing irritability and fighting. Cage bars are preferable over solid walls to let airflow in provided the floor and ramps are solid rather than made of wire, which increases risk of foot injuries. A domestic guinea pig must be indoors and out of direct sunlight and drafts. Off-limits, then, are the spots in front of windows, near climate-control vents and in the breeze of a fan. 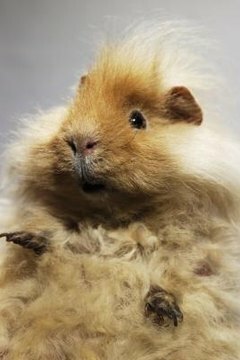 Guinea pigs do not like to be isolated, so place the cage somewhat near activity, such as in the family room. If you have children or other pets in the home, ensure that the cage has a secure top and sides and is stationed so you can supervise and restrict access. Avoid cedar and pine bedding, as these materials are toxic to guinea pigs. Otherwise the bedding needs to be soft, absorbent and chewable, layered about 3 inches deep and cleaned before it becomes too littered or smelly. Chewable wooden and cardboard toys help file down the guinea pig's continuously growing teeth, but plastic pieces are choking hazards and can damage the throat. While wheels and balls provide great exercise for smaller rodents, these can actually cause spinal and foot injuries to guinea pigs. Routine nail-clipping also reduces risk of foot injury. Vitamin C, in the form of fruits and vegetables, is a necessary supplement to the guinea pig's diet. Don't breed guinea pigs. Breeding, whether intentional or not, is a risky process that kills one in every five gestating females. A litter of pups is born with fur and ready to walk, and these put excess weight and stress on the mother during pregnancy. Separate your guinea pigs from the beginning, according to gender, to prevent this unnecessary complication. Otherwise, have your guinea pigs spayed or neutered by a reputable veterinarian skilled in the process. Squeezing a guinea pig or smothering it with hugs will cause her to fear you. For this reason, you shouldn't let young children hold cavies, or even adults who haven't been shown how to gently handle the animals. Safely handle your guinea pig by carefully picking her up with one hand under her rump and back legs and the other hand under her chest, with your index and middle fingers separated by her front leg. This will prevent biting and squirming. Be gentle but firm so she cannot fall. When you place the cavy back in her cage, place her in back-end first. If she wiggles, hold her above the floor for a moment to teach her not to. Transporting your guinea pig home from purchase is one thing, but generally speaking, travel can cause the animal unnecessary stress. Going on vacation is not a reason to take the cavy with you. Instead have a trusted friend or relative watch her in the safety of your home. If travel is unavoidable, such as when you're moving permanently, place the guinea pig in a roomy cage with soft lining, and secure the cage from moving around the car. Should the trip take two or more hours, plan stops along the way to give food and water to your guinea pig and clean up any messes she may have made. Maintain a temperature of 65 to 80 degrees. Never leave the guinea pig alone in the car. Even the healthiest guinea pig will need regular veterinary visits. Take yours to a vet who specializes in exotic animals as soon as possible after bringing the guinea pig home, and then every six to 12 months thereafter. Emergencies include problems with the teeth, feet or diet. Take your pet to the vet immediately if you note that the cavy has not eaten or eliminated within a 12-hour period. How Much Outside Time for Guinea Pigs?